Maxentius, his laureate head right. she-wolf. and twins (Romulus and Remus) between them. Minted at offcina A in Ostia, middle to late 309 A.D.
Sutherland, C.H.V., "Roman Imperial Coinage", Volume 6 (RIC), Ostia, p403s, nr 16.
hinterlassenen Sammlung und Aufzeichnung des Herrn Paul Gerin" (Voetter-Gerin), Ostia, Maxentius, p201, nr 1. Sear, D.R., "Roman Coins and their Values" (RCV 4th Revised Edition), p319, nr. 3777, variety from officina A. 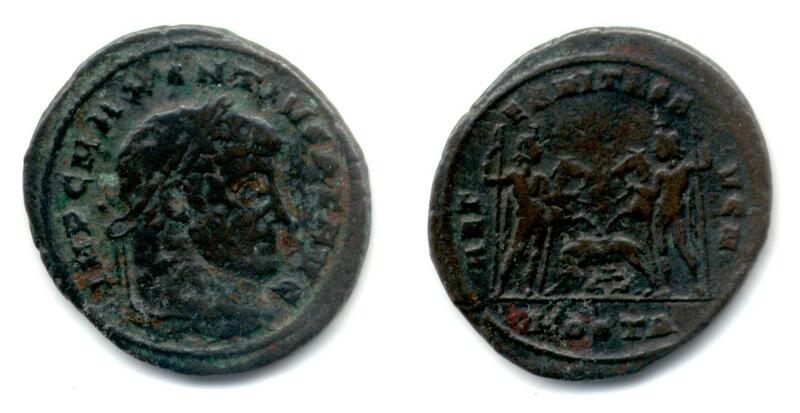 Van Meter, D., "Handbook of Roman Imperial Coins", p284, nr 15.